The Lisette cotton lawn top is FINALLLLLLY finsihed. I don’t know what my problem is with finishing things. It took me forever just to sew on the darned sleeves! I really don’t care for this shirt. Its wearable, and it will be cool this summer, and I love the fabric. But I think it looks a little like some strange caftan or smock or something from the 70’s. Sometimes these things happen. Also, its too big, too low cut, and too bell sleeved. Whatever! Its done, and its breezy. Two important characteristics of clothing for an Indiana summer. So a while ago, I posted about this lovely Lisette fabric I bought and planned on making into a shirt. It feels lovely, and I had guessed it was a cotton lawn, and it turns out I was correct. Leisl, from Oliver + S, designed a whole line of these lovely prints for Jo-Ann’s fabrics! You should seriously take a look at the Oliver + S website, they just have adorable, sort of retro graphics that I love, even though I don’t sew for kids. She’s even got a new line of patterns from Simplicity that are very cute. My gripe is that of course they only run to a 22. I don’t think I love any of the patterns enough to take all the time to grade them up at this point in time, but who knows what they’ll come out with as the collection grows. I think it will get a lot of wear this summer, its very light and breezy!! The Pin Tuck Shirt, which has had many names, is finally “finished.” First, it was just The Pin Tuck Shirt, then the Dang Pin Tuck Shirt, then The Expletive Pin Tuck Shirt, and later two versions of The Expletive Expletive Ping Tuck Shirt. I even lost it and had growing resentments towards it. But alas, it is done. Sort of. I hate it. I think I’m going to take 3 or so inches from the hem, add some strange dart/pleats to the collar, and add elastic to the sleeve ends. Hopefully it will be wearable! See how the collar has some bizarro gaping issues? I don’t know what is causing that. Underneath it you can see the unfinished Annie Tunic. Its so close to being done, and yet I haven’t finished it. But it has to be finished by this coming weekend, so it’ll get done eventually! I’m making a shirt with this fabric. Its very soft and flowy and has a great feel to it. 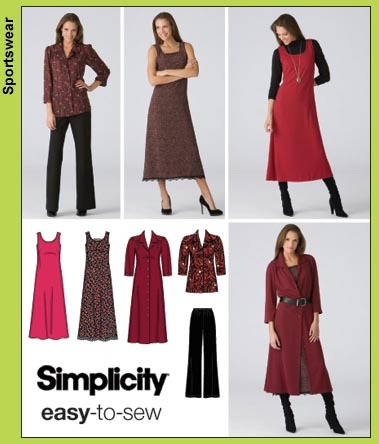 Its from Simplicity 3700. I’m just cutting the jumper down to shirt length and adding sleeves. I, Amy Jo of http://www.BlueHippoArts.com, sign up as a participant of Me-Made-March ’11. I endeavour to wear at least one handmade garment, refashioned garment, or wearable accessory each day for the duration of March 2011!! So that means I can wear a scarf or hat (if its part of an all day outfit, and not like, oh, its cold! I should put on a hat!) but not carry a purse or clutch and count it. And of course, any articles of clothing that I’ve made count! In order to do this successfully, I’m going to have to make at least a couple more shirts between now and March, and hopefully a pair of pants or a skirt. I’d really like to make a pair of trouser jeans, but I’m not sure how much farther I have to go with altering my Burda pants pattern. I’ve got a vintage yellow sheet with flowers on it that I’d like to make into a button down shirt, lovely soft and drapey blue oxford cloth, and this interesting linen looking cream with flowers print that I’m thinking would be good button downs. Then I also have a black gauze that I’ve been wanting to make into a simple tunic for almost 2 years. So if I can get those shirts and a pair of jeans done, I think I’ll be good to go! Oh, and a progress update on the Dang Pin Tuck shirt… I have the sleeves but have lost the body of the shirt! Egads! Who does that? I think that perhaps I’m not meant to ever finish the stupid thing. At the rate I’m going, it might be done next fall. Stupid shirt.